Add some flair to your side by side with these colorful switches and switch plates. Designed to work with the: Yamaha Rhino and Viking, Polaris RZR (All Models), Polaris Ranger (All Models), Arctic Cat Prowler and Wildcat, Can-Am Commander and Maverick, and Kawasaki Teryx. We offer standard switches in red, blue, green, and amber. 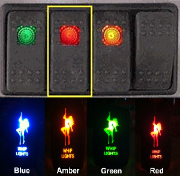 Our custom switches feature many different pictures to match your UTV needs.